We’ve already told you how to use SmartArt to create a diagram, and we’ve shown you how to move and size it and apply simple formatting. But many diagrams involve different levels of information and benefit from more sophisticated formatting techniques. After you create a basic diagram, you can customize it at any time by clicking it and then using the commands on the Design and Format contextual tabs. Add and change the hierarchy of shapes. You can remove a shape by selecting it and then pressing the Delete key. You can also rearrange shapes by dragging them. Switch to a different layout of the same type or a different type. If some of the text in the original diagram doesn’t fit in the new layout, that text is not shown, but it is retained so that you don’t have to retype it if you change the layout again. Change an individual shape—for example, change a square to a star to make it stand out. Apply a built-in Shape Style. Change the color, outline, or effect of a selected shape. 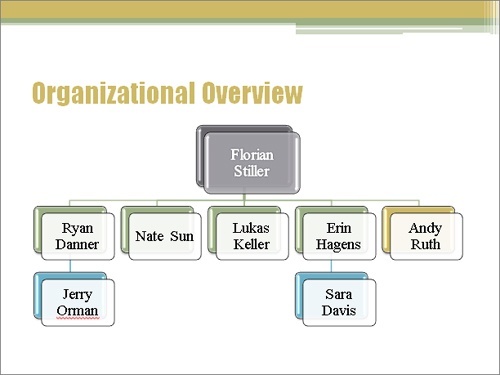 In this exercise, you’ll customize an organization chart by adding subordinate shapes. You’ll change the layout of the chart as a whole and then change the color, size, and text of individual shapes. Display slide 5, click the diagram to activate it, and then select the Ryan Danner shape for manipulation. On the Design contextual tab, in the Create Graphic group, click the Add Shape arrow, and then click Add Shape Below. PowerPoint adds a shape to the organization chart. Open the Text pane, click to the right of the bullet symbol, type Jerry Orman, and press Enter. PowerPoint adds a duplicate shape at the same level in the hierarchy. Our instructions assume you are entering text in the Text pane. Typing and pressing Enter in a diagram shape enters a new paragraph in the same shape instead of creating a new shape. In the Text pane, click to the right of Erin Hagens, press Enter, press Tab, and then type Sarah Davis. The new shape is a subordinate of Erin Hagens. 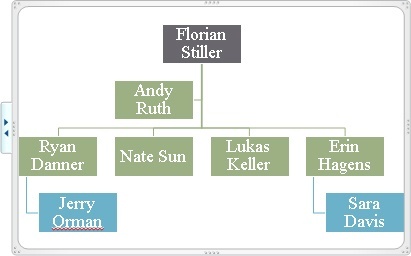 In the diagram, select the Florian Stiller shape for manipulation, click the Add Shape arrow in the Create Graphic group, and then click Add Assistant. In the Text pane, click to the right of the arrow bullet symbol, and type Andy Ruth. Then close the Text pane. In the diagram, select the Nate Sun shape for manipulation, and then in the Create Graphic group, click the Promote button. The selected shape moves up one level in the hierarchy. Nate Sun is now a peer of his former manager. Don’t worry if your chart still shows the box and handles in the former location of the Nate Sun shape. It will disappear when you work on a different shape. Drag the handles around the frame of the diagram until it fills the available space on the slide. On the Design contextual tab, display the Layouts gallery, and point to each thumbnail in turn to see a live preview of the various layout options for an organization chart. Then click the second thumbnail in the second row (Hierarchy). Some of the new PowerPoint 2010 layouts allow you to insert pictures of people as well as their names. Display the SmartArt Styles gallery, and after previewing the available styles, under 3-D, click the last thumbnail in the first row (Cartoon). Andy Ruth is an assistant, not a manager, so select his background shape, and on the Format tab, in the Shape Styles group, click the Shape Fill arrow. Then under Theme Colors in the palette that appears, click the tan box (Tan, Text 2). Click the Florian Stiller shape (not the text), and then in the Shapes group, click the Larger button three times. Be sure to click the border of the shape. Otherwise, you will select the text for editing instead of the shape itself. The background shape grows with the selected shape. Display the WordArt Styles gallery, explore the options, and then click the third thumbnail in the first row (Fill – White, Drop Shadow). The text in the shape is now a contrasting color. Click outside the diagram frame. You can now see the final result. The number of employees that you want to include in an organization chart often determines which layout you choose. Save the ReorganizationMeeting presentation, and then close it.